Senior executives of U.S.-based casino group Caesars Entertainment Corp visited Japan last week as the company plans to bid for a casino licence in that country. According to media reports, Caesars chief executive Mark Frissora (pictured, centre) met Osaka’s governor and also the city’s mayor last week to discuss the company’s strategy if it eventually wins the right to develop a casino resort in Japan. The casino operator is said to have also presented plans to develop a project in Tomakomai, a small port city in northern Japan. 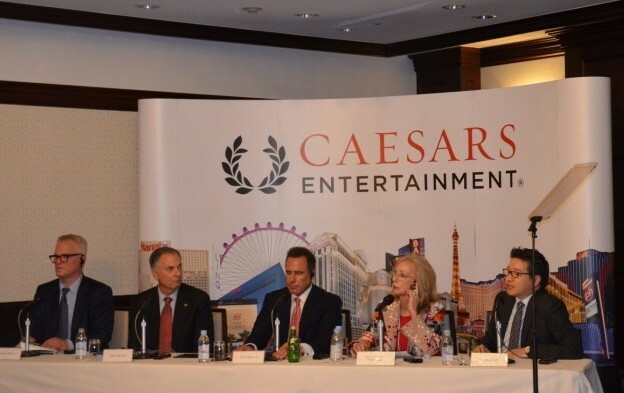 During a press conference, Caesars’ CEO also announced a commitment of JPY25 million (US$237,074) for responsible gaming initiatives in Japan, according to a Friday press release. Mr Frissora also discussed the company’s ambitions to work with Japanese officials and local partners to develop an integrated resort in Japan. Caesars recently became an official partner of Osaka’s bid to host the 2025 World Expo. The company was the fourth casino firm to sponsor that city’s bid to host the event. Several executives from the casino sector have said that the ability of companies to invest capital in a Japan scheme would in likelihood depend on the language contained within pending legislation. The number of casino resorts to be allowed in the country is still to be decided, as well as the implementation of a casino entry levy.